Cold water is the highest comfort to refresh ourselves during the hot Summer. The Fresh Water Cooler uses evaporation cooling to lower the water temperature to a re­fresh­ing level. The principle of the Fresh Water Cool­er is used since thousands of years: Evaporating water absorbs energy, reducing the temperature of the remaining water. The ancient Egyptians have used water filled pottery to keep vegetables fresh. The Arabs have built wind towers and ponds to reduce the tem­per­at­ure in their houses by evaporation cooling. The Fresh Water Cooler is using the same principle to cool water. The cold water is stored in an additional tank to supply when needed. In ad­di­tion electricity is saved by re­duc­tion of the air-conditioning load inside buildings. Lower water temperatures are achieved when the Fresh Water Cooler is combined with a chiller. The Fresh Water Cooler reduces the load and the operation and main­ten­ance costs of the system. The Fresh Water Cooler is operating very successfully since year 2000 in the United Arab Emira­tes and pro­vid­ing cold fresh water for apart­ments and staff accom­mod­ations. 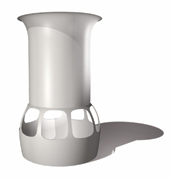 The selected components and ma­teri­al assures a long service life and low main­ten­ance costs. The cooling costs of the Fresh Wa­ter Cooler are very low compared to com­pres­sion chillers as evaporating water is a very cost effective coolant. The system is amortising within the first year. The Fresh Water Cooler can either be designed for 100% load or as an energy saver in case a conventional system is already installed. We are offering accurate planning and simulation of the yearly per­form­ance to reduce the investment in the cooling system.